Written by Studio1337 on May 22, 2015. Ten years ago, we began a great adventure into the world of Web design and development. 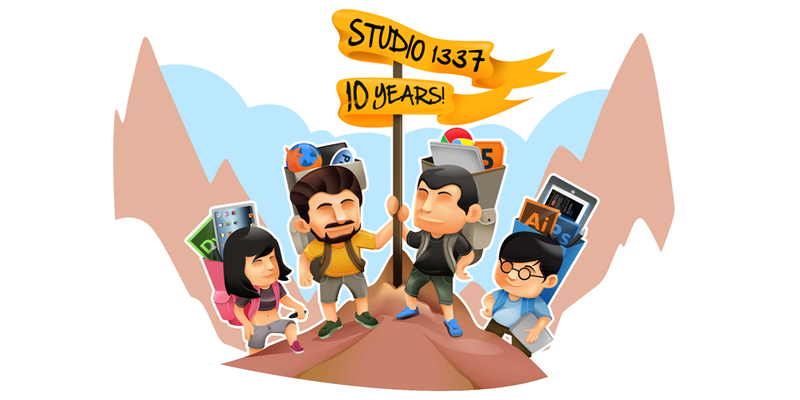 On May 22, 2005, a small group of developers from both sides of the Atlantic came together and founded Studio1337. Over the course of time, we’ve witnessed extraordinary changes to the Internet, how it works and how people use it. We’ve seen design styles come and go. We’ve seen eCommerce blossom and mobile browsing redefine user experience. We’ve worked hard to stay in front of trends and ensure our clients get the most out of new technologies as they emerge. But two things have not changed – our love for our clients and our passion for the visual and technical artistry that create success for them. You have made this journey exciting. You have challenged us to expand our knowledge and capabilities. You have demanded we perform better with every new site we create. We thank you for giving us purpose and helping us reach this business milestone. We salute you as we celebrate 10 years of service, and we look forward to serving you for many more years to come.